This data set provides land cover classifications for Mato Grosso, Brazil, for the years 2000-2001 and 2003-2004. The classifications were derived from annual vegetation phenology information from a time series of Collection 4, 16-day Moderate Resolution Imaging Spectroradiometer (MODIS) Normalized Difference Vegetation Index (NDVI), and the Enhanced Vegetation Index (EVI) vegetation data, at 250-m resolution. A decision tree classifier was trained using field observations and Landsat TM data of land cover from 2003-2004 to identify seven land-cover classes. The classifier was applied to the 2000-2001 and 2003-2004 MODIS ENVI and EVI data. Figure 1. Location of Mato Grosso State, Brazil in South America (inset). MODIS classification results from 2003-2004 for image tiles h12 v10, h12v09, and h13v10 covering most of Mato Grosso State. Land cover in the southern half of the state is dominated by a complex mosaic of Cerrado, grasslands/planted pasture, and cropland. The northern half of the state is a mixture of forest cover and planted pasture, while two major cropland centers straddle the cerrado/forest division in central and western Mato Grosso. The investigators were DeFries-Bajpai, Ruth; Anderson, Liana; Coura, Samuel Martins da Costa; Espirito-Santo, Fernando Del Bon; Hansen, Matthew C.; Jasinski, Ellen W.; Latorre, Marcelo Lopes; Lima, Andre; Morton, Douglas and Piromal, Rodrigo Sbravatti. You may contact Morton, Douglas (douglas.morton@gmail.com). LBA-ECO LC-39 DECAF (DEforestation CArbon Flux) Model Inputs and Outputs: 2000-2006 (Same location and overlapping time period). There are two GeoTIFF (.tif) files with this data set. The files are land cover classifications for 2000-2001 and 2003-2004 of Mato Grosso, Brazil, developed from one year of MODIS data, beginning each year with a MODIS composite starting day of year 273 (e.g., September 29, 2000). MODIS tiles h12v10, h12v09, and h13v10 were used to derive the final land cover classification extent. The data set covers the period 2000/09/01 to 2004/12/31. Classification and change maps at 250-m resolution provide essential new information that can be used to set conservation priorities. Spatially explicit information from satellite data sources provides important details for assessing conservation goals for total habitat, landscape connectivity, and the location of agricultural frontier zones. In addition, mapping the spatial extent of agricultural expansion and classifying transitions from cerrado and transition forest to cropland are critical first steps for evaluating tradeoffs between land use and conservation along the Amazon arc of deforestation. These classification maps have been used to evaluate region patterns of agricultural expansion (Morton et al., 2011), agricultural management (Galford et al., 2010), agricultural suitability (Jasinski et al., 2005), and biophysical impacts of land cover conversion from forest to pasture and cropland in the region (Pongratz et al., 2006). Classification accuracy was assessed using field observations of each cover type. Please see the complete description of validation results in the Morton et al. 2011 companion file. The Brazilian state of Mato Grosso lies at the southern extent of Amazon forests in Brazil. The boundary between Amazon forests and Cerrado savanna/woodlands, sometimes referred to as transition forests, is one of the most active deforestation frontiers in the world. During 2001-2005, Mato Grosso accounted for more than 15% of all tropical forest losses worldwide (Hansen et al., 2008). Historically, land has been cleared for cattle ranching. More recently, cash crops such as soybeans, corn, cotton, and sugarcane have been planted on lands previously cleared for pasture or in areas deforested specifically for cropland expansion (Pongratz et al., 2006). 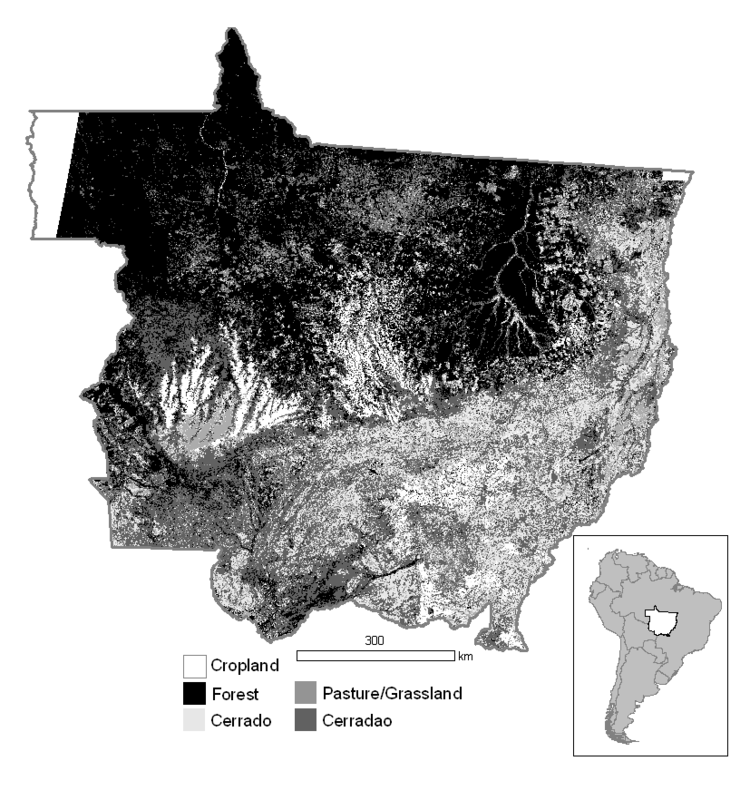 The land cover classification for Mato Grosso for 2000-2001 and 2003-2004 was based on vegetation phenology information from a time series of Collection 4 MODIS 250 m data onboard the Terra platform, beginning each year with MODIS composite starting day of year 273 (e.g., September 29, 2000). The date was chosen to correspond with the onset of rainfall in central Mato Grosso. The phenology metrics derived from both NDVI and EVI time series provided information on seasonal phenology of different land cover types that was used in a decision-tree classifier derived from field reference points for each land cover class. MODIS tiles h12v10, h12v09, and h13v10 were used to derive the final land cover classification extent. PLEASE NOTE: these three tiles do not provide full coverage of Mato Grosso state. Also, no analyses were done for areas outside of Mato Grosso state, since training data from southern Para state, Goias state, Mato Grosso do Sul state, and Bolivia were not included in the classification development. MODIS Vegetation Indices data (MOD13Q1 16-day composite images) were downloaded from the NASA’s Earth Observing System (EOS) data gateway for spatial tiles h12v10, h12v09, and h13v10 for the period May 2000 to March 2005. Three MOD13 bands from each time period were used for this analysis: NDVI, EVI, and QA (Huete et al. 1999). Data preprocessing to remove cloud and other data quality artifacts was conducted using the entire data set; only cloud-filtered MODIS data were used for land cover classifications. QA data were used to identify low-quality pixels (clouds, aerosols, missing data values, etc.) in the time series. Low-quality NDVI and EVI pixel values were replaced with predicted values by fitting a local spline function around missing values in each pixel’s time series. Annual NDVI and EVI time series for the periods day of year 273- 2000 to 273-2001 (day of year 273 ~30 September) and 273-2003 to 273-2004 (24 16-day composites) were filtered using an iterative Fourier smoothing algorithm based on the 0th, 1st, 2nd, and 3rd harmonics to remove artifacts from clouds that were not flagged in the QA layer (Roerink et al. 2000). Annual wet season (12 composites: 273-081) and dry season (11 composites: 097-257) metrics (minimum, maximum, mean, standard deviation, amplitude, and median) were generated separately for NDVI and EVI time series. These metrics (n=36) and the Fourier fit terms (1st, 2nd, and 3rd harmonics) from the NDVI and EVI smoothing procedure were used as inputs to the decision tree analysis for each year. Field observations of land cover from June 2004 were expanded into polygon training data by digitizing cover type boundaries on near-coincident Landsat TM data at 30-m resolution or ASTER data at 15-m resolution. Training data polygons were then used to select pure pixels for each land cover class at MODIS 250-m resolution to train the decision tree classifier. A total of 24,000 250-m pixels were designated as training data in one of the following seven classes: cropland, pasture, Cerrado, deforestation, forest, grassland, or water. Metrics values were extracted for each training pixel, and the resulting table was imported into the Splus statistical package (Insightful 2004). A series of decision tree analyses were run using the seven classes of training data and time series metrics from 2003-273 to 2004-273. For all analyses, a random subset of training data (30%) was set aside for validation of the decision tree result. Decision tree rules from 2003–2004 training data were then applied to 2000–2001 time series metrics. Refer to the companion file morton_mato_grosso_land_cover_chapter_lba_archive.pdf for a discussion on the decision tree scheme. Galford G.L., J.M. Melillo, D.W. Kicklighter, T.W. Cronin, C.E.P. Cerri, J.F. Mustard, C.C. Cerri. 2010. Greenhouse gas emissions from alternative futures of deforestation and agricultural management in the southern Amazon. PNAS 107: 19649-19654. Hansen M.C., S.V. Stehman, P.V. Potapov, T.R. Loveland, J. Townshend, R.S. DeFries, K.W. Pittman, B. Arunarwati, F. Stolle, M.K. Steininger, M. Carroll, C. DiMiceli. 2008. Humid tropical forest clearing from 2000 to 2005 quantified by using multitemporal and multiresolution remotely sensed data. Proceedings of the National Academy of Sciences, 105, 9439-9444. Huete A.R., K. Didan, T. Miura, E.P. Rodriguez, X. Gao, L.G. Ferreira. 2002. Overview of the radiometric and biophysical performance of the MODIS vegetation indices. Remote Sensing of Environment, 83, 195-213. Jasinski E.W., D.C. Morton, R.S. DeFries, Y.E. Shimabukuro, L.O. Anderson, M.C. Hansen. 2005. Physical landscape correlates of the expansion of mechanized agriculture in Mato Grosso, Brazil. Earth Interactions 9, Paper 09-016. Morton, D.C., R.S. DeFries, Y.E. Shimabukuro. 2011. Quantifying Cropland Expansion in Cerrado and Transition Forest Ecosystems with MODIS Satellite Image Time Series. unpublished manuscript. Biospheric Sciences Branch, Code 614.4, NASA Goddard Space Flight Center, Greenbelt, MD 20771, USA (DCM). Department of Geography, 2181 LeFrak Hall, University of Maryland, College Park, MD, 20742, USA (DCM, RSD). Division de Sensoriamento Remoto, Avenida dos Astronautas 1758, Insituto Nacional de Pesquisas Espaciais (INPE), Sao Jose dos Campos, SP, Brasil (YES). Morton, D.C., Y.E. Shimabukuro, B.F.T. Rudorff, A. Lima, R. Freitas, R.S. DeFries. 2007. Challenges for conservation at the agricultural frontier: deforestation, fire, and land use dynamics in Mato Grosso. Agua & Ambiente 2(1): 5-20. Pongratz J, L. Bounoua, R.S. DeFries, D.C. Morton, L.O. Anderson, W. Mauser, C. Klink. 2006. The impact of land cover change on surface energy and water balance in Mato Grosso, Brazil. Earth Interactions 10, Paper 10-019.